Maaike Bergman was born in Capelle aan den IJssel, the Netherlands on October 4th, 1991. In 2011 she started the Bachelor Biomedical Sciences at Maastricht University, specializing in Biological Health Sciences. For her bachelor’s thesis she studied the relationship between sleeping patterns and eating behavior in overweight or obese children and adolescents, under the supervision of Dr. Anita Vreugdenhil. Having graduated in 2014, she continued her studies with a master’s degree in Global Health, for which she spent 3 months at McMaster University in Hamilton, Canada. Subsequently, she pursued a second master’s degree in Biomedical Sciences, also at Maastricht University. During the first year of this master’s program she did a 4-month internship at The Maastricht Study, a large regional study on type 2 diabetes and its complications. For this internship she studied the relationship between body composition and left ventricular hypertrophy, under supervision of Dr. Carla van der Kallen and Dr. Ronald Henry. 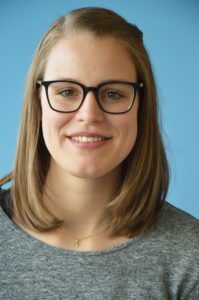 In the second year of the program, Maaike performed an 8-month internship at the division of Gastroenterology-Hepatology and the department of Pharmacology and Toxicology at Maastricht University. Under the supervision of Pauline Verhaegh, she worked on the optimization of lipid raft visualization in liver cells and tissue slices, to ultimately investigate the effect of Ursodeoxycholic acid on these lipid rafts. In September 2017, Maaike started a PhD at the department of Human Movement Sciences-Human Biology under the supervision of Prof. Matthijs Hesselink and Dr. Vera Schrauwen-Hinderling. During her PhD, Maaike will focus on the effect of High Intensity Interval Training (HIIT) on non-oxidative glucose disposal in skeletal muscle of obese adults.